There are more than 3,000 islands in northern Vietnam's Ha Long Bay, but only one of them houses one of the rarest primates on the earth. Cat Ba, the largest island in the bay, is a remarkable place. Moist tropical forest lays like a rich green blanket on limestone mountain peaks that thrust out of the equally rich sea. The entire island, both land and sea, has been declared by Unesco as a biosphere reserve of the world. But the truly remarkable thing about this place is its rarest denizen, Trachypithecus poliocephalus poliocephalus. The golden headed langur. 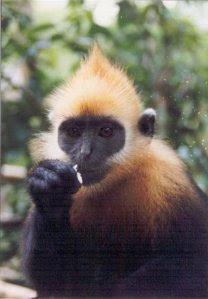 Also known as the Cat Ba langur, this striking gold and black creature was not always so rare. In the 1960's there were nearly 3000 on the island, cruising the treetops for leaves and nuts by day and resting in limestone caves by night. Unfortunately for the langur, however, man valued it for more than its aesthetic beauty. Believing the creature's bones to have medicinal qualities, the locals hunted them to the brink of extinction. By the year 2000 there were only 53 individuals left on the whole island. Thankfully, the government there has realized how precious these langurs are and has taken steps to preserve them. Nearly half the island is a national park and for once the langur's numbers have actually increased. The future is still uncertain for the Cat Ba langur. Only seven groups remain, and most of those are all females. Only three small groups actually produce young. With langur mothers giving birth to just one child a year, those numbers don't sound too promising. It is a bleak situation, but I can't help but be hopeful. As long as we humans are willing to face our mistakes head on and attempt to rectify them, there is always hope. We are the most powerful species on this planet, and we have used that power to do a great deal of damage, but it is that same power that we can use to save this planet. If you would like to aid the plight of this remarkable creature, go to http://www.catbalangur.org. They have many ways you can help. Gorgeous creature! Thanks for sharing this valuable information. Have a great weekend.